Backlash against Facebook contributed to a sharp slide in all major market indices Tuesday. Technology stocks fell sharply on Tuesday, with analysts saying the market is in for a “major white knuckle period" for the rest of the year. The Dow Jones Industrial Average plunged by more than 500 points mid-morning, dragged down partly by Boeing, which unsettled investors after ditching a planned conference call to discuss its 737 MAX airplane, the model that crashed in Indonesia last month, killing all 189 people on board. The S&P 500, a broader measure of the market, and the blue-chip Dow have now erased all gains for 2018. Apple and Facebook pulled down the tech-heavy Nasdaq to its lowest level in seven months, continuing what has been a six-week slide for the technology sector. Each of the FAANG stocks, the acronym used for Facebook, Amazon, Apple, Netflix and Google, also slipped into a bear market on Monday, which Wall Street defines as a loss of more than 20 percent compared to a stock’s 52-week high. “Right now, there is a buyer’s strike on tech stocks and we believe many of these names are oversold,” said Daniel Ives, managing director of equity research at Wedbush Securities. Apple and Facebook especially “are facing a slew of worries around fundamentals, valuations, and overall growth concerns heading into 2019,” he said. On Monday, Apple shares fell 4 percent after the Wall Street Journal reported the iPhone maker had slashed orders from key suppliers, signaling that their new devices may not be the blockbuster hits Apple has experienced in previous years. Several analysts have also downgraded or cut their price targets on Apple over future growth concerns. “The straw that broke the camel’s back for Apple has been the very soft iPhone supplier checks, which has caused an avalanche of selling,” Ives told NBC News. Last week, Apple lost its status as the world’s only publicly traded, trillion-dollar company after Lumentum, a company that makes facial recognition and augmented reality components, said it received a request from one of its largest suppliers to reduce shipments. Apple is Lumentum’s biggest customer, though the company did not say who made the request. Facebook shares hit their lowest level since February 2017. 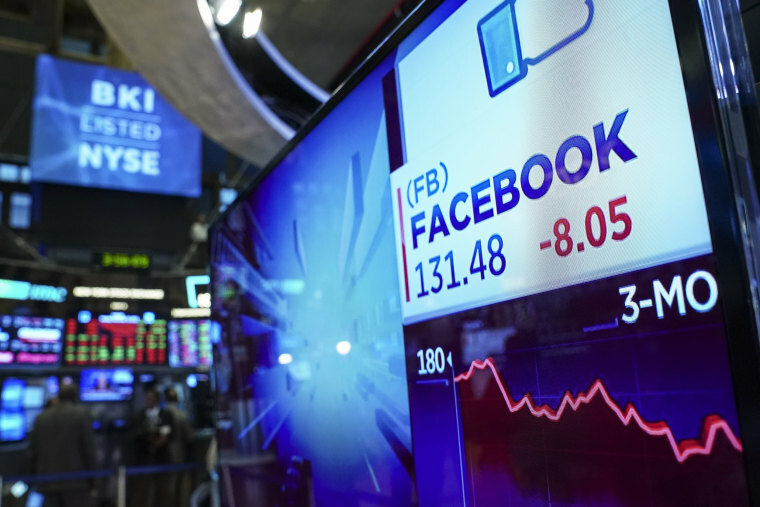 The embattled social media company is on track to complete its third straight month of losses, making it the worst losing streak in Facebook’s history as a publicly traded company. The downward slide comes as Facebook grapples with the continued fallout from its handling of user privacy and a recent report from the New York Times that detailed leadership failures and dirty tactics Facebook allegedly used to smear competitors in an attempt to deflect attention.